Users have the ability to record audio from within Otus or embed pre-recorded audio into Advanced Assessment items. This feature can be added by clicking the Simple Feature button located on the text toolbar within a question. You can embed various audio player types and customize the UI. Audio files can be uploaded in MP3 format, and must be less than 5MB. Authors can also use audio hosted on the Internet. 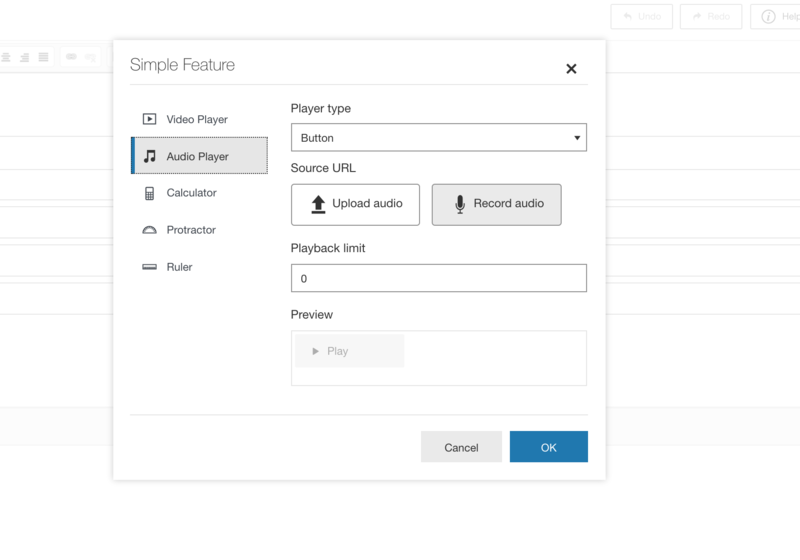 Select the audio input from the drop down menu, and click on the grey box to start recording. The Pause button allows you to pause the recording and resume it, while the Finish button stops the recording. You can playback the audio, and when you are satisfied with the recording click OK to upload the file. Upload Audio - Underneath Source URL, click on +Add, and a modal will appear to either upload or embed audio. There are three methods to upload audio: Select the Upload Asset tab, and drag your file to the Drag and drop files here selection box. Click on Choose Files, and select audio from your computer, click Upload, then click Ok. Select the Embed Asset tab, and insert audio URL in the respective field, then click Ok.
Playback Limit - The number of times the user is allowed to play the audio, 0 being unlimited. Heading - Heading of the audio player. Caption - Description of the audio being played. Play - Defines if the play button is displayed to the user. Default setting is on. Pause - Defines if the pause button is displayed to the user. Default setting is on. Seek - Defines if the user can change the play position. Default setting is off. Play Bubble - A play bubble will be displayed to the user with controls. Play must be enabled. Available in Button UI only. Timer - Defines whether the timer will be displayed. Default setting is on. Progress Bar - Defines if the progress bar is visible to the user. Default setting is off. Volume Control - Gives the user control over volume. Default setting is on. Volume Meter - Defines if the volume meter is displayed to the user. Default setting is on. Responsive Layout - The component's size will be scaled responsively based on its container's size. Download Link - A link to download the audio will appear. Default setting is off. Waveform - Defines if a waveform will be visible. Default setting is off. Waveform URI - Insert URI of the waveform to display. Click on +Add to enter a waveform image. Details:Format - If the file format is not specified in the Source URL it is automatically assumed to be mp3. You can specify the file extension here.